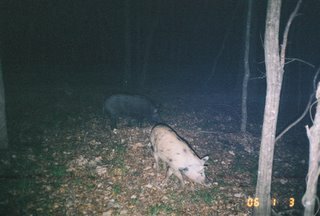 I placed a remote camera in the Turkey Creek area of the Big Thicket in hopes of catching an elusive cougar, jaguarundi, ocelot, or maybe even a wolf, but all I got were feral hogs! These swine pests are not native to this country and it is believed were introduced here way back in the late 1600's by Spanish explorers as domesticated livestock. They eventually became free-ranging and feral which led to their eventual control over Texas lands. According to a Texas Cooperative Extension survey of 491 East Texas landowners back in 2004, the feral hog population has literally exploded over the last ten years. A conservative estimate was said to put their population in Texas at 1.5 million. 1) They compete with other animals, such as white-tailed deer, turkeys, etc. for food sources. 2) Their "rooting" behaviour is destructive to agricultural crops and native plants. 3) They're predatory towards young calves, sheep, deer, and ground-nesting birds. 4) They can spread diseases such as swine brucellosis, tuberculosis, tularemia, trichinosis, just to name a few. 5) Their wallowing behaviour can erode the banks of ponds, sour the water and in turn cause oxygen depletion and fish kills. So you see that they are nothing but trouble. Even though they can be hunted year round in Texas by whatever means the chances of totally getting rid of them are very slim, if not impossible.